﻿Join us for BREAKFAST as we explore together what the Bible tells us about our responsibility to pray. The Church in Akron is a family of believers who love the Lord Jesus as our Savior, the Bible as His word, and one another as members of His body. We have been serving the Akron, Ohio area since 1970. We are a diverse group made up of all ages and many kinds of people. We believe the church should reflect the community it is in, and so everyone is welcome. 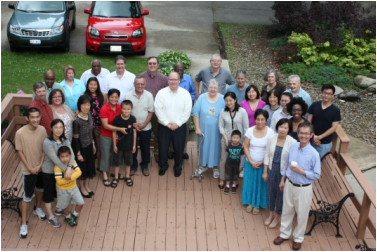 It surprises some that we have a large number of Chinese speaking believers among us. For this reason a portion of this site is in Chinese. If you are looking for a place for your family, we have an active children's work and youth ministry. We endeavor to ground our young people in the Bible and help them to genuinly love the Lord Jesus by the time they are young adults. It is our hope that they will each choose to follow the Lord the rest of their lives. A portion of this site was created by and for our young people. Feel free to explore this site to learn more about us. Contact us if you have any questions. Mostly, we hope you will come to visit.